How will augmented reality (AR) change the way that the fashion industry showcases and retails its products? And how will this influence our shopping experience in the future? According to consulting firm Digi-Capital, there will be 900 million AR-enabled devices by the end of 2018. Does this mean that no industry will be left untouched by augmented reality? As a matter of fact, the number of industries embracing augmented reality are still growing. Since 2016, it has become a mainstream trend for brands to apply augmented reality to their marketing strategy. Hence, the AR industry is predicted to reach global revenues of 90 billion dollars by 2020. Furthermore, a research from Digital Bridge has shown that 69% of the consumers are expecting retailers to launch augmented reality apps within the next half year. In addition, insights from Google have shown that 34% of smartphone and tablet users say they would like to try augmented reality shopping and 61% even mentioned they would prefer to shop at stores that offer this technology. Multiple retailers and brands are noticing the effects of these consumer trends and decided to adapt to it in a technical way. Moosejaw was one of the first magazines to boost interest in their catalogue applying augmented reality apps. In 2011, the brand launched an X-Ray Reader app from Marxent Labs, which allowed consumers to virtually undress the female and male models in their catalogue. All you had to do was download the app and point your camera to the model. In less than a second, the X-ray function showed a view of the same model, but in underwear. Although it has been quite some years ago that this app was launched, people still remember this strong effort to compete with the latest offerings of The North Face and other outdoor retailers. 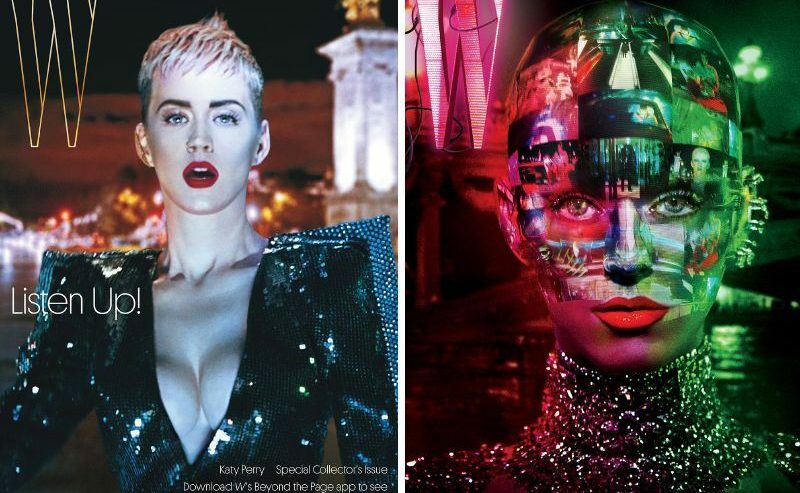 Another great marketing stunt is the one from W Magazine in their latest September issue, including an AR-powered cover of Katy Perry. As one of the most prominent fashion magazines, this has definitely been a confirmation of the fashion world embracing AR. In partnership with The Mill, a visual effects production studio, the magazine has created a computer-generated image of the pop star on the cover of the Sept. 2017 Collectors Issue. To make this possible, W Magazine created a special app called Beyond the Page for iOS and Android. Again, at first sight, the magazine looks like a classic edition until parts of it come to life when viewed through the lens of a smartphone or tablet. With this extra virtual layer, Perry´s face becomes a 3D model and it´s possible to unlock exclusive content. But there are even more augmented reality examples: The New Yorker and Elle have made similar attempts, experimenting with AR covers. And it makes sense, because print editors are able to think more out of the box when it comes to creativity. According to research firm MagNet, magazine sales have fallen 53% since 2011 which caused that the pressure of standing out has become greater than ever. Approximately 67% of the shoppers that get into a dressing room of a store, will become actual buyers. As people are nowadays more and more relying on the benefits of online shopping, retailers have been forced to find a way how to get people to step foot inside their stores. Topshop for example, found a way to adapt to this consumer trend. For the London Fashion Week in 2014, the fast fashion retailer partnered up with the technology agency Inition, to create a unique virtual reality runway show. This virtual front row experience enabled people to have a 360° view of the Topshop Unique runway show. Customers in the store could simply take a seat and enjoy watching the latest designs on live stream. Augmented reality startup, HoloMe, even decided to transcend virtual runway shows by creating a holographic version of catwalk shows for users to watch at home. HoloMe decided to team up with the British fashion brand RIXO London, to enable consumers to receive and project the holograms into their own rooms by only using their smartphones. During the show, models are wearing pieces from the designer´s latest collection, using HoloMe´s software solution, which makes is possible to visualise high-quality, life-like holograms. The “try on” apps form an indispensable trend when it comes to the merging of AR and the fashion world. Converse, created an app to enable customers to imagine what a product would look like on-foot without actually having to go to the store. By simply pointing your iPhone camera at your leg, you get a good impression of how the pair of shoes would look like. The Sampler app from Converse also predated other innovations like the Van´s Virtual Footwear experience in which people would step on footprints on a mat to try on different sneaker models. Nike instead, uses AR to sell the perfect hyped sneaker with the SNKRS app. This application enables people to buy limited edition sneakers by unlocking product pages using their smartphone’s camera. Another example of mixing digital objects with the real world to sell products, are virtual makeup apps. The L’Oreal’s Makeup Genius app for example, has more than 20 million downloads and allows users to virtually try-on beauty products on their phones. After the app became a success, other brands like Charlotte Tilbury, Sephora and Rimmel have followed suit. The application Dubbed Dressing Room by Gap, enables people to virtually try out clothing for men and women. The app is a Google Project Tango-exclusive which means it only works on phones that support the AR platform. After selecting a product from the virtual shelf, you can select the size and body size so you can get a better idea of how the clothes will fit. The augmented reality technology is applicable from fast fashion to luxury products and enables retailers to reinforce their brand value through storytelling. AR is going to change the way that fashion is created, visualised and eventually sold. The upcoming year, an explosion of opportunities will be expected which will totally redefine what we understand as fashion nowadays. No industry will be left untouched by AR. As a matter of fact, the number of industries embracing it, are still growing. When looking at the fashion world, AR will impact everything from runway shows to shopping and is set to reconnect physical and digital retail. Eventually, these features will be as important for a retailer as having a website. However, the possibilities that AR offers to extend creativity and originality seem to be endless. And the transformative aspect of it, is exactly the reason why (fashion) retailers are applying it to their strategy.